July 18, 2012-- Greater Toronto REALTORS® reported 6,435 condominium apartment transactions during the second quarter of 2012 – down by 2.6 per cent compared to 6,609 transactions reported in the second quarter of 2011. New listings for condominium apartments were up substantially on a year-over-year basis, climbing by 19 per cent in comparison to 2011. Greater Toronto Realtors reported 3,679 sales through the first 14 days of July 2012, representing a 5.6 per cent increase compared to the 3,484 sales reported for the same period in 2011. New listings were up by 14.4 per cent over the same time frame. “Housing demand remained strong in the first half of July. Sales growth occurred in the regions surrounding the City of Toronto. In the City of Toronto, where sales were down, the relatively higher cost of home ownership likely prompted some buyers to purchase elsewhere in the GTA. Higher costs in the City of Toronto include the upfront payment of the additional land transfer tax,” said Toronto Real Estate Board (TREB) President Ann Hannah. The Bank of Canada kept its overnight rate target at 1 per cent on July 17th, 2012. Borrowing costs have been unchanged at this level since September 2010. The text accompanying the announcement reiterated many of the same points that were in the June 5th statement. This includes the wording of the bottom line, which leaves the door open to future rate hikes, but taken together with an overall weakening of the outlook pushes back the timing of any future rate increases. The Bank said that recent developments were pointing to a renewed contraction in Europe, while the deceleration in growth has been greater than anticipated in China and other emerging economies. The Bank also noted that the economic expansion in the United States was continuing at a gradual but somewhat slower pace. That said, these will be paced by the impact of lower commodity prices on Canadian incomes and wealth, as well as by record-high household debt. The Bank also added that housing activity is expected to slow from record levels. In light of all those factors, the Bank now expects the Canadian economy will grow by 2.1 per cent in 2012 and 2.3 per cent in 2013. That’s down from its previous projection for growth of 2.4 per cent this year and next. In contrast, the Bank now forecasts growth of 2.5 per cent in 2014, up from 2.2 per cent in the April Monetary Policy Report (MPR). The slightly weaker outlook for growth in 2012 and 2013 means it will now be the second half of 2013 before the economy returns to full capacity. This was previously forecast to occur in the first half of 2013. Core inflation is expected to remain around the 2 per cent target going forward, but total CPI inflation is now expected to dip noticeably below that level owing to the recent drop in gasoline prices, with futures prices suggesting this will persist for some time. So while the cuts to the forecast for economic growth and a weakened global outlook mean rates will likely remain lower for longer, the Bank is indicating it would still like its next move to be a rate hike, provided global and domestic trends play out as expected going forward. 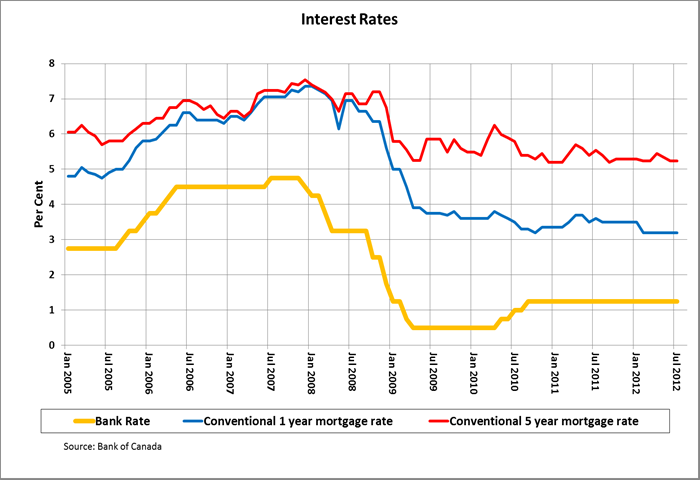 As of July 17th, 2012, the advertised five-year lending rate stood at 5.24 per cent. This is unchanged from June 5th, when the Bank made its previous policy interest rate announcement. The Bank will make its next scheduled rate announcement on September 5th, 2012.